You never know when you will have to know how to pick a lock. There are times when you may have accidently locked something valuable away in a room. People lock money, keys and other valuable items away by mistake. If this happens to you, there is a solution. You can even do this yourself. It doesn’t require any special locksmith tools to complete the task. All you need is a standard hair pin. 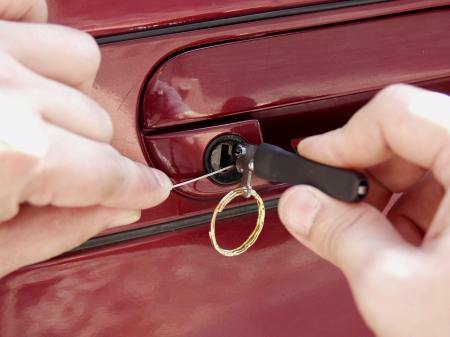 There is always the option of calling a professional locksmith in to help. However, the fees for this visit may be expensive. If you want to save yourself a little money in case the need arises, and add another skill to your resume, then this is a great little thing to master. If the locks in your home or office are simple, then you may be able to pick the locks yourself. Here is a relatively easy way you can pick your lockswith a hairpin. Read on for more information. Determine exactly what kind of lock you will have to pick. The door knobs that are commonly used today can be classed as two types. They are either push button types or a turn style lock. These are easy to be picked with a standard hairpin. Insert any hairpin in the hole located in the middle of the lock. You will see this hole on the push button style locks. Apply pressure to the center until there is a complete release. You may find that the release on modern push bottom locks are off centered. They may be situated on the left or right side as opposed to the middle. Just use the hairpin and feel around until you locate the release and apply pressure. Place the standard hairpin in the middle just like it was a key. Doing this procedure will release a turn style knob lock. If you can’t find the release, feel around. There are some locks that require pressure to be applied at a specific spot. Move the hairpin around slightly to find the spot. This may take a few seconds, but it can be done. Feel your way around whole applying pressure at different locales. You can also pick a lock with two regular hairpins. There are locks that won’t respond to the pressure applied with just one. You can double up and try to pick the lock this way.If it’s difficult to release the lock using a single hairpin try your hand at two. Apply pressure evenly to release the lock.